I woke up this morning determined to move my body. Yesterday, I made biscuits. I ate three of them. No big deal. No regrets. They were buttery and warm and delicious, but today I need to move. I put on my stretchy pants, my sneakers, and a nice long sleeve shirt and headed out the door. I then headed right back in the door. IT’S SOOOO COLD. I checked my phone. It said that it was 27 degrees. Yikes. I live in California. I am not prepared for this. I looked at our front steps. They were completely iced over. Glimmering at me as if to say: “I dare you to try not to break your neck on me, Klutz.” Geez, my front steps have a really bad attitude in the morning. They are totally not morning steps. Obviously we needed to modify. I opened our coat closet and got out the biggest, puffiest coat I could find. It’s white and stretches down to my mid-thigh. There is fur that lines the hood. It’s cute, but It is not what I would call exercise wear. If you live in my town, you might have seen me this morning. I was the woman clad in a semi dressy fur-lined coat, jogging the streets. Fancy as hell. Eskimo street couture. After I jogged a few miles and I could no longer feel the tip of my nose or the sides of my face, I decided it was game over. I came home and whipped up this tasty smoothie. Today, in place of your weekly juicing recipe, we are going to do a little blending. Sometimes it is nice to have a breakfast smoothie or two (or three, or four, or nine) in your recipe arsenal. Juicing is beyond awesome, but can be time consuming. If you want something quick that is both nutritious, filling and packed with fiber, a smoothie is just perfect. 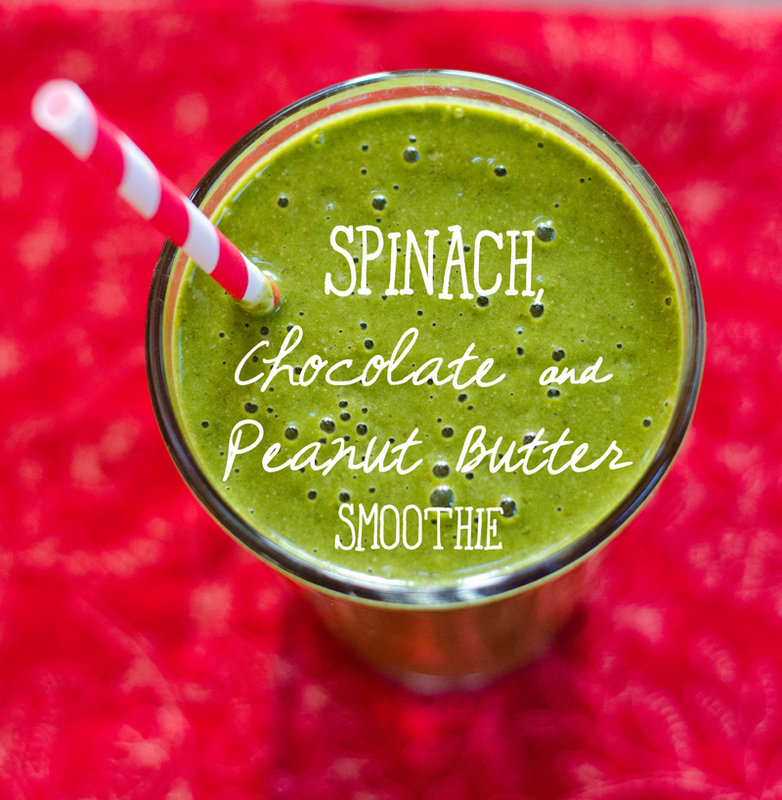 Plus, though this particular smoothie is green, it tastes like chocolate and peanut butter. Who can get mad at that? Not I, friends, not I. I’ve also added some secret and sneaky powerhouse ingredients. You get some serious omega-3’s with the addition of flax seed meal and some chia seeds. Did I mention fiber? Yeah. You are going to be fiber-licious. Okay. I’ll stop talking now. 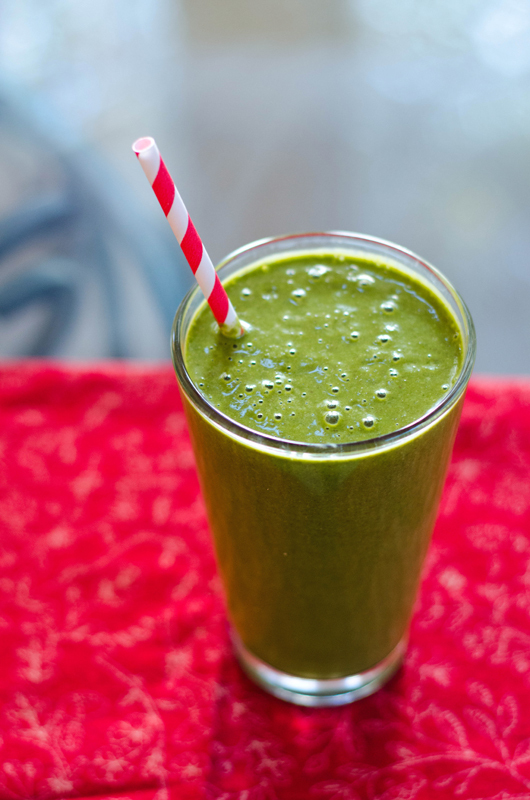 Load all of your ingredients into your blender and blend away! Simple, simple, simple. I am going to try this one tonight. I have been craving healthy but indulgent smoothies. What you just described about your morning is a daily battle for me. 😉 It’s been CRAZY cold here in Texas, so I have been working out indoors (i.e. workout videos) instead of running outside… and I’m not gonna lie: I kind of miss it. But I don’t have the dedication you have to run in that thick coat. Because, umm, I don’t have a coat that’s crazy heavy. Also, this smoothie recipe looks delightful. I’ll be making a variation of this very shortly! Thanks for this recipe! I’ve been adding spinach to all of my regular fruit smoothies (even my 11 month old loves them) and I was wondering if spinach would work with chocolate as well. Mmmmm. Can’t wait to try this one out! Hey! Sounds really nice! I’ll try this. Just one question. When you say frozen banana..you literary mean to freeze a fresh banana?? Correct! I usually remove the peel before freezing though, since it makes it easier. Just stick them in a ziplock bag and use them for smoothies as needed.